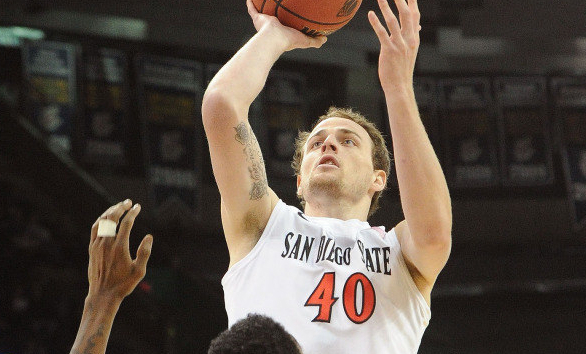 Poll: How Far Will San Diego State Aztecs Go in the NCAA Men’s Tournament? The dance is under way. Will the Aztecs keep their moves going? By beating New Mexico State 73-69 in overtime Thursday night in Spokane, the San Diego State men’s basketball team advanced to a game at 3:10 p.m. Saturday against North Dakota State, which itself needed overtime to defeat Oklahoma 80-75. Fourth-seeded SDSU will play a 12th-seeded team in a game airing nationally on TNT, said SDSU athletics. How far will the Aztecs go this year? This is the fifth in a series of weekday polls in Times of San Diego. For earlier posts, visit Opinion. How far will San Diego State advance in NCAA men’s basketball tournament?